Boogie Stomp! NYC Kick-Off Event | Boogie Stomp! | The Musical | Boogie Stomp! Bob, Arthur, Smokin' Billy Slater, Marek Sapieyevski, Joaquin Cotler and others! BOOGIE STOMP! The Rent-party edition! BOOGIE STOMP! is a theatrical evening starring two of the greatest jazz/boogie/stride/blues pianists in the world, Bob Baldori and Arthur Migliazza. After electrifying audiences all around the globe, Baldori and Migliazza are thrilled to bring this fast-paced, vibrant show to New York City. Every night’s a party at BOOGIE STOMP! when these two music giants hit those onstage pianos, bringing to life all the fire and excitement of American popular music. 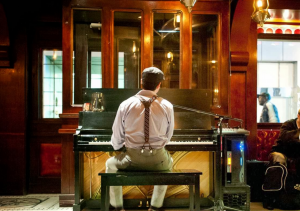 In honor of BOOGIE STOMP!’s arrival in New York City, The Rum House is hosting a special night of boogie-woogie piano on May 6th at 9:30PM. Join Arthur and Bob, along with local pianists Smokin’ Billy Slater, Marek Sapieyevski, Joaquin Cotler and others, for a night of rollicking rhythms, 4-hand jams, 6-hand jams(!?! ), cutting competitions, and more! We hope to see you there! No cover charge – come enjoy a great evening of boogie woogie piano and join us for a couple drinks! Check out www.edisonrumhouse.com for more information!